A single Aston Martin car window sticker produced to celebrate the 1-2 finish in 1959. This sticker is a Facestick sticker, it has an adhesive front and is designed to be used on the inside of a window facing outwards. Printed in Red, White, & Blue on to a Clear vinyl (Dark Grey background is an example background and is not part of the sticker). Macine cut to shape shown. 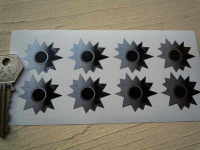 Sticker measures approximately 160mm x 70mm. Bullet Holes for Bodywork. Set of 8. 1.5". Bullet Holes for Glass. Set of 6.